The entrance to the Beit HaMikdash – King Solomon’s Temple according to one interpretation. The connection of the Haftorah to the Parsha: The Parsha tells us about the construction of the Mishkan - The Tabernacle (traveling temple), which housed the sacred objects of the Jewish people. The Mishkan contained the Ark of the Covenant with its Cherubim (golden winged angels), the Ten Commandments, the Menorah, and the Sacrificial Altar. It was built after at the beginning of Israel's 40 year journey through the Sinai Dessert and stood for another 440 years in the land of Israel. In the Haftorah we read about the building of the Beit HaMikdash (the Holy Temple), which replaced the Mishkan. The storyline of this week’s Haftorah: The Haftorah starts with the mention of King Solomon’s great wisdom and continues with King Solomon and Hiram, King of Tyre making a peace treaty (Tyre-which is located in what is Lebanon today). The Haftorah discusses the manpower that King Solomon recruited for the building of the Holy Temple. He had 30,000 men to work in Lebanon, rotating 10,000 at a time. He sent each man up to Lebanon for one month after which time they were able to stay home for a two month stretch. There were 150,000 men working on the Temple with 3,300 supervisors. They started with moving huge stones to build the foundation of the Temple. The construction began 480 years after the Exodus and in the fourth year of King Solomon’s rule (he was 16 at the time). The temple was 60 cubits long, 20 cubits wide and 30 cubits high. A cubit is roughly 18”. The text continues with additional specific information as to how the Temple was built. 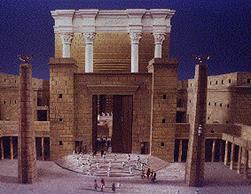 Once the temple was finished King Solomon paneled the temple with cedar boards and planks. The Haftorah concludes with Hashem’s promise to King Solomon, “As for the temple you are building, if you follow my Torah I will keep my promise that I made to you and your father King David; I will dwell among you and I will not abandon you”. In the time of the Beit Hamikdash there was only one place to worship God. Israel was a United Monarchy, Jerusalem was it’s capital, King Solomon’s Temple stood on Mount Zion. There were 613 observable commandments. Israel was ruled by a king. The Kohanim & Levi’im presided over the temple. there was three pilgrimage holidays being observed. Prophets, the messengers of Hashem foretold the future. Had seven names, Shlomo, Yedidyah, Kohelet, Agur, Yakeh, Lemuel, and Ithiel. His father was King David. Was crowned as king at the age of 12! He ruled for 40 years and passed away at the age of 52. As King, he led the building of the Beit HaMikdash, starting at 16 years of age, which lasted for 7 years. He was extremely wealthy; by some estimates his wealth increased by $250 million dollars a year. He was famous for his stables that housed 40,000 horses and 12,000 horsemen. King Solomon had 700 wives and 300 concubines. Is quoted as the smartest man to ever live. He was able to give 3,000 explanations to every Pasuk in the Torah. He knew all 70 languages spoken in the world at that time as well as possessing the ability to communicate with all the living creatures in the animal kingdom. Once the Queen of Sheba traveled 7 years by caravan just to meet him and quiz him with regards to his wisdom. After their first meeting, the Queen of Sheba remarked that the King was much wiser than his reputation had suggested. Founded 3 cities; the fortress city Megiddo, Hazor and Gezer in the north of Israel. Instituted, among others, the two mitzvot of Eiruv and Nitelat Yadayim (the ritual washing of hands) and the third blessing in Birkat Hamazon of Bonei Yerushalayim. The Eiruv is a string surrounding an outer perimeter of an area thus designating it as a permissible place to carry things on Shabbat. Authored 3 books: 1) Kohelet, Ecclesiastes 2) Mishlay, Proverbs, which concludes with the song Aishet Chayil sung on Erev Shabbat. 3) Shir Hashirim, Song of Songs. Famous Phrases: Mishlay, Proverbs 4:2-3, “Aytz chaim he lamachazikim bah, v’somcheha me’ushar. De’rache’ha darchei Noam, v’chol nesevoseha shalom”,”It is a tree of life for those who grasp it, and its supporters are praiseworthy. Its ways are ways of pleasantness and all its paths are peace”. These verses are recited by the Congregation as the Torah is placed into the Ark. Haftorahman’s lesson of the week: We must remember what Hashem says, “Build me a House of Prayer and you will always find me there”. The message is “Don’t stay home on Shabbat; come to Synagogue”. What is the origin of the word Synagogue? Here’s a few answers. from Greek synagoge "place of assembly, synagogue," literally "meeting, assembly,"
from syn- "together" + agein "bring, lead"
This week, go out of your way to invite someone, who normally wouldn’t have attended services to pray with you in Synagogue. Helping someone come closer to God is a big mitzvah. Map: This story took place in Jerusalem.